Your day-by-day itinerary now includes Deltin Royale Casino. We've included these beaches for you: Baga Beach and Palolem Beach. Step out of the city life by going to Agonda Beach and Animal Shelter Agonda. There's still lots to do: enjoy the sand and surf at Dona Paula Beach and Viewpoint, hit the bull's-eye at Milsim Goa Paintball, and make a trip to Shri Saunsthan Gokarn Partagali Jeevotham Math. For more things to do, other places to visit, ratings, and more tourist information, refer to the Goa road trip planning website . Dibrugarh to Goa is an approximately 15.5-hour flight. You can also drive. Expect a daytime high around 35°C in July, and nighttime lows around 30°C. Wrap up your sightseeing on the 18th (Thu) to allow time to travel to Mumbai. 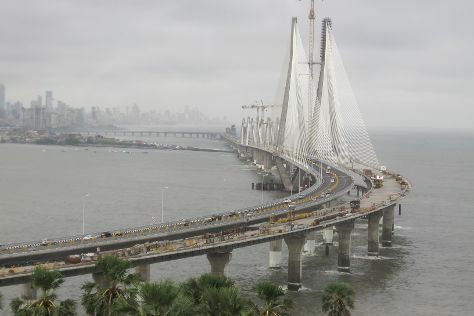 Start off your visit on the 19th (Fri): snap pictures at Bandra-Worli Sea Link, tour the pleasant surroundings at Chowpatty Beach, then take a memorable drive along Marine Drive, and finally wander the streets of Nariman Point. To see maps, ratings, where to stay, and other tourist information, go to the Mumbai driving holiday planning app . Traveling by combination of bus and flight from Goa to Mumbai takes 5.5 hours. Alternatively, you can drive; or take a train. In July, daytime highs in Mumbai are 35°C, while nighttime lows are 29°C. On the 21st (Sun), you'll travel to Lonavala. Aamby Valley City is a township developed by the Sahara India Pariwar in Pune district in the Indian state of Maharashtra. Your day-by-day itinerary now includes Kundalika Rafting. Escape the urban bustle at Independence Point and 19 Degree North, Adventure Park. Get out of town with these interesting Aamby Valley City side-trips: Kolad (Bhira Dam (Tata Powerhouse Dam), Kuda Caves, & more) and Shri Ballaleshwar Ashtvinayak Temple (in Nagothane). To find where to stay, maps, reviews, and more tourist information, you can read our Aamby Valley City sightseeing planner . Getting from Mumbai to Aamby Valley City by car takes about 2.5 hours. In July, daytime highs in Aamby Valley City are 35°C, while nighttime lows are 29°C. You'll set off for home on the 23rd (Tue).